How do you know how well your site ranks in the search engines? You can go to a search engine, type a keyword phrase, and see what happens. If you’re not on the first page, check the second; if you’re not there, check the third. Then go back and do it for 50 search terms on several search engines. It will take a while. Another problem with manually checking position is that if you’re logged into a Google account, Google will start “personalizing” your search results to what it thinks is most appropriate for you; you won’t see what the average user sees. Luckily, you can get help. Many programs can check your search engine position for you. You tell the program which keywords you’re interested in, which search engines you want to check, and which website you’re looking for in the search results. Then you let the program do its work. Traditionally, search engines have “banned” such tools. In theory, if Google notices that a computer is using one of these tools excessively, it may ban search queries from that computer. That doesn’t mean it hurts your website, of course, because the queries are not coming from your website. As for WebPosition, it recently changed from Windows-based software that you purchase to a monthly web service, so the software runs on WebPosition’s servers, and accessing the data is its problem, not yours. 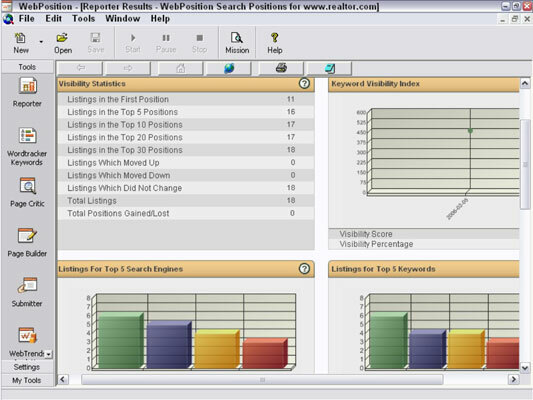 You can see a typical keyword report, showing positions for each keyword in several search engines — in this case, produced by WebPosition. Many other programs can create site-ranking reports for you — both through programs that are installed on your computer and through web-based services, such as Wordtracker, WebCEO, Rank Tracker, and even a few free services, such as GoogleRankings. Here’s a quick tip for a quick rank check. Go to Google, click the little cog icon in the top-left corner of the page, and select Search Settings. Find the Results Per Page slider and move the slider to 100. (You won’t be able to do this unless you turn off Google Instant Predictions first.) Click the Save button, and now, each time you search Google, you see 100 search results, so finding your site in the results may be easier.